Tag line: "They're Here and They Want to Meet the Neighbors"
A horror film geared towards young adults, 1987’s The Gate doesn’t feature much along the lines of blood and gore, but its story of backyard demons and hell on earth is, even 25+ years later, enough to give the kiddies a nightmare or two. Shortly after a large tree topples over in his backyard, Glen (Stephen Dorff) notices smoke rising from the hole it left in the ground, and hears strange noises coming from inside it. 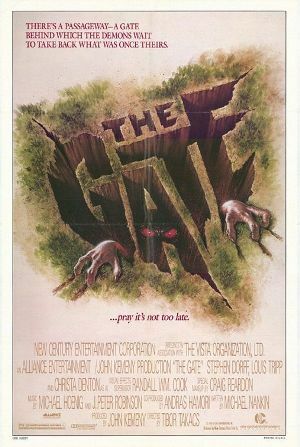 He himself doesn’t give it a second thought, but his best friend Terry (Louis Tripp) believes the hole is actually a portal into the underworld, a gate of sorts that, if not closed quickly, will release an ancient demon, one powerful enough to destroy the entire planet. Left in the care of his older sister Alexandra (Christa Denton) when his parents (Scot Denton and Deborah Grover) go out of town, Glen invites Terry to spend the night, and together they try to seal off the Gate. But will they close it in time, or has something already made its way through? Stephen Dorff, who would later co-star in movies like Blade and The Iceman, was around 13 years old when he made The Gate, and while his performance here is far from his best, he’s plenty effective as the young man trying to ensure that an evil God doesn’t wake from its thousand-year slumber. The real star of the film, however, is its special effects, which bring the demons (both small and giant sized) so convincingly to life. Creepiest of all are the mini-demons, which look very similar to the creatures in the 2010 remake of Don’t Be Afraid of the Dark. Despite their size, these tiny monsters are sure to give you the willies (when Terry accidentally falls into the backyard hole, these diminutive demons chew on him, and attempt to drag him deeper down). In addition, a zombified workman (Carl Kraines), who shows up at key intervals throughout the movie, is guaranteed to make your skin crawl. Though it has its slow points (especially in the middle section) and suffers a bit in the story department (the “rules” to close the gateway seem kinda arbitrary, and change as the film progresses), its well-realized special effects make The Gate one of the few kids-centric ‘80s horror flicks that works just as well today as when it was first released.